There are a few ways you can make broccoli rice, one is to chop it, the other, which I prefer is to blitz it in a food processor. 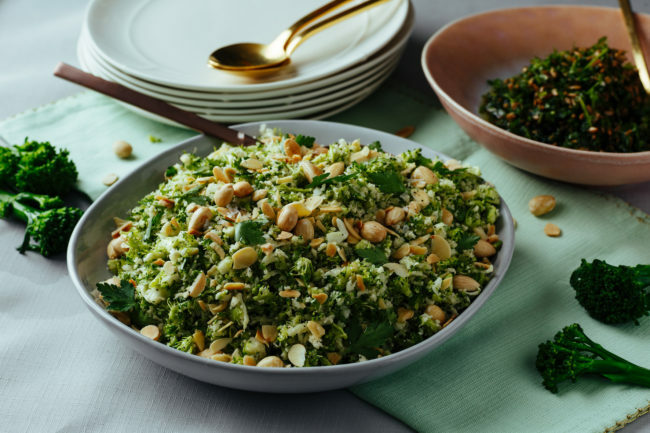 You can enjoy my broccoli rice salad raw or cooked, if I cook the rice I normally sauté it until it is bright green; you could also stir-fry or steam it. A lemon dressing works perfectly with this salad, keeping it fresh and light. You can add in any leftover vegetables you may have, tomatoes, spring onion or avocado work as a perfect addition. 1. Cut the broccoli head into florets and the stem into small pieces and blitz in a food processor in batches until it starts to look like rice. 2. In a large bowl, add the chopped herbs, nuts, lemon zest and broccoli. 3. Mix thoroughly and season to taste. 4. Serve on a large sharing platter and sprinkle with any extra nuts and herbs.